Do we really need a cinematic universe for The Conjuring? I would argue no. Let's take a look at what we've had so far: The Conjuring is a great, old fashioned horror film with a handful of terrific scares; Annabelle is a sloppy, misguided spin-off that very rarely works; and The Conjuring 2 is a back to basics, genuinely frightening sequel. Now we have Annabelle: Creation, a prequel to a spin-off that is miles stronger and more efficient than it has any right to be. So, wait. Hang on a second. Maybe we don't need a universe for every film related to The Conjuring, but if the entries are going to be this good, why complain? 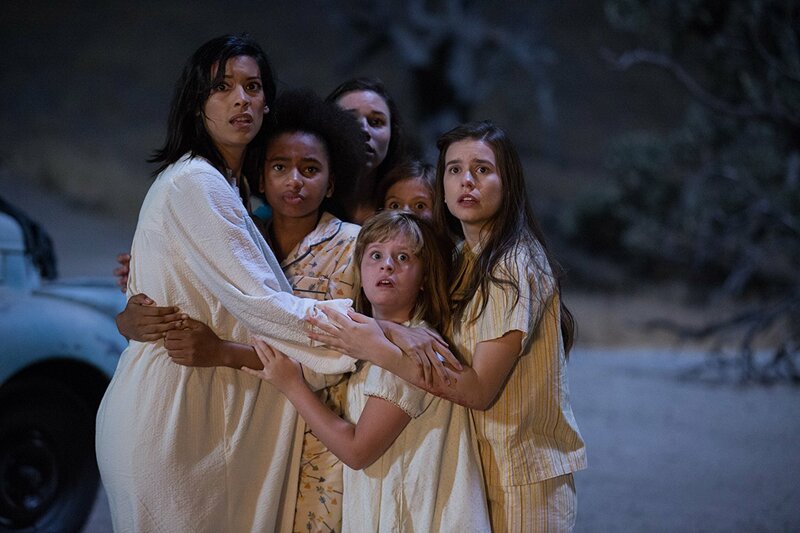 In 1955, the nun Sister Charlotte (Stephanie Sigman, engaging and likeable as a protagonist) and six orphan girls move into a house owned by the Mullins family. Their orphanage has closed down, and the Mullins have graciously opened their home to them. On the first night, one girl named Janice (Talitha Bateman) wonders the house and stumbles across a locked bedroom. When the door strangely opens itself to her, she explores the room and unintentionally opens a locked closet containing an old doll. Not long after, the house is seemingly being terrorised from something beyond our world. Four films into the franchise and The Conjuring series has dropped three pretty stellar entries. Annabelle: Creation doesn't quite live up to the two focal films of the series - if only because it isn't memorable enough in the character department to truly excel - but it's such a vast improvement over its predecessor that when the lights came back on in the cinema as the credits rolled I found myself in a mild state of shock over how much I'd enjoyed the previous two hours. Creation is a pretty bog standard horror film, but that doesn't mean you can't have fun with it. Bar the fantastic basement-set scene, the first Annabelle film almost entirely abandoned a horror atmosphere, favouring cheap jump scares and poorly executed fake outs instead. Creation sees a much appreciated return to stronger and more effective horror territory, bringing to the screen all the best kinds of conventional horror. There are some genuinely effective jump scares, a decent handful of elongated tension pieces punctuated with jolts and bolts along the way - in fact, from about the start of the second act, the film scarcely lets up on the tension and the jumps until it wraps up. Creation even boasts a double-bluff-fake-out scare so good that I feel like dedicating an entire paragraph to it, just to do the moment justice. In the middle of one of the film's most suspenseful moments, director David Sandberg sets up a jump scare so obviously destined to be a fake out that you almost roll your eyes at it. Right when you're about to lose patience, though, he whips the moment back around and ends it on something genuinely unsettling, even if we've seen it before. It features no loud bangs, no sudden screeching music or cheap ways to make you leap out of your seat - it does so with smart direction and clever atmospheric work. Hats off to Mr Sandberg, here. Sandberg has clearly learned a lot since his feature length debut Lights Out, a film that knew how to work a horror scene but struggled to really tell the story it wanted to tell. Creation, despite being a good half hour longer, feels infinitely more streamlined in its narrative work. The film is essentially this franchise's version of an origin story, but it wisely skips over explaining the origins until the final act. Before that, everything is a mystery to us, we're rarely shown anything. Sandberg hides everything in shadows and in the edges of the frame, making our eyes dart around every image to source the next jump. You'll try to outsmart it, but you'll rarely be successful. Unfortunately, it's the final act in which Creation threatens to derail. When the long winded explanation finally arrives it comes in the form of a flashback coupled with a soppy narration, and the scene is tonally out of place with everything either side of it. Creation has the potential to be a deeply emotional horror film but it interestingly chooses to sidestep this for most of its two hours. By bringing this half hearted emotion back to the forefront for one scene, though, the film's final act is thrown off balance, resulting in a jarring blend of smaller, softer moments and some questionably over the top scares. It's still an effective climax to the film, but it's a notable step down from the two acts that precede it. Still, Creation's finale is much less problematic than both the conclusion of its predecessor and the conclusion of Sandberg's one other feature. There's a lot here to like, and while this Annabelle prequel doesn't quite make it to the upper echelons of the genre in the 21st Century, it does a good enough job to not be swallowed up and left behind. There's plenty here to remember, and plenty of reasons to return to it for a couple more viewings. Sandberg demonstrates remarkable control in crafting horror and, after that dodgy first spin-off, he's pulled The Conjuring franchise back onto good form again. I'd call that a win-win. While its resolution may not work as well as the rest of it, Annabelle: Creation is a surprisingly effective horror film that delivers bolts and jolts in the dosage you'd want it to.